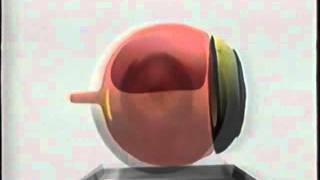 Vitrectomy is a surgical procedure used to correct retina tears and detached retinas. 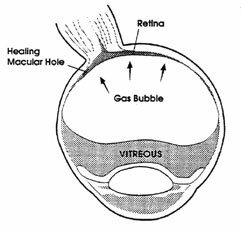 In the surgical procedure called vitrectomy, the vitreous gel (vitreous body) is removed to prevent it from pulling on the retina and replaced with a bubble containing a mixture of air and gas. 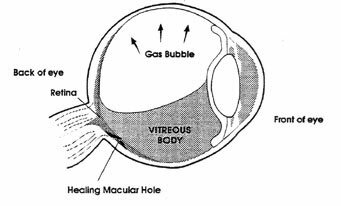 The bubble acts as an internal, temporary bandage that holds the edge of the macular hole in place as it heals. Vitrectomy surgery is performed under local anesthesia and often on an out-patient basis. Maintaining a face down position is crucial to the success of the surgery. Because maintaining this position can be difficult, it is important to discuss this with your doctor before surgery. Where is facedown recovery equipment available? Your doctor may recommend face down recovery equipment. This equipment can be rented from Bay Area Vitrectomy. Call (510) 540-8200 to schedule a delivery or to ask for more information. Click here for a video explanation on why facedown recovery is a requirement.